Located adjacent to the pool and expanding out onto the beach, Maui offers a refined twist on fresh salads, sandwiches, juices and snacks. 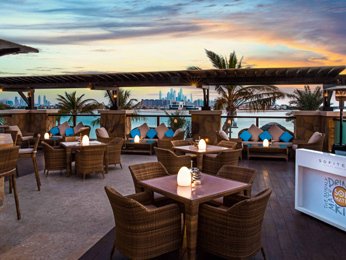 Providing delights of Arabic and Oriental fare, guests can indulge amongst the shade of the gazebos or the relaxing ambience of the bar. 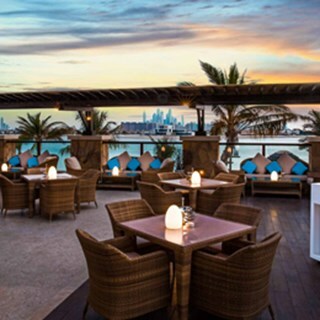 For those who wish to sample the Shisha, a rooftop bar provides incredible views of the sun setting over the Arabian Gulf. Bland tasteless food and little atmosphere in the restaurant. Not as bad as your buffet restaurant but wouldn’t eat there again. 5th time in Dubai and without doubt the worst food offering of any of the hotels I’ve stayed in (Waldorf, Fairmont, One & Only). Very, very disappointing experience. 1 star. Lovely beach side restaurant and was pleasantly surprised at how good the food was. We enjoyed the indian cuisine on our dine around menu and would highly recommend visiting. Service was excellent ! My husband had a fantastic birthday meal. The food and service was out of this world as was the beach side location. Perfect! I booked for my anniversary the romantic setting, menu was wrong and food serving was not the food i already booked and confirmed. When leaving they stopped me for 10 minutes by the pool waiting to check if i paid or no as if am stealing and leaving! Although what i got from the reservation desk is that the romantic cabana’s payment SHOULD be in advance when booking. Food was great! But the Poor integration between the rest. booking desk in the hotel and the restaurant ruined my night. I am absolutely disgusted with the service that i have received here. I dined at Maui for Valentine's evening and went for the cabana package. The food was well below the standard I would expect for this type of even and I'm appalled with the service received. The day after I called to make a complaint and was told I would be called back. And nothing. Eventually I called back and got through to the manager Rizwan and after a short conversation and somewhat meagre apology I was told he would speak to his colleague and call me back.. again nothing... I called back. He isn't available but would call me back... And guess what? I'm still waiting... I would advise anyone reading this to not waste their money here. I would recommend the 101 at the one and only. Just as expensive but a lot better service and food/drink.